Santa Clara Valley Viticultural Area grapes are grown both on our ranch and our neighbor’s in the Santa Clara Valley. 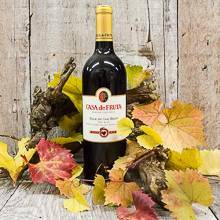 In the tradition of our great uncle wine makers from Calabria, Italy, this special blend of red wines with residual sweetness is a favorite. The current blend is 60% Merlot, 20% Zinfandel 20% Sangiovese.. French Oak aged for 24 months. 8/1/2011 – What year is the wine? I had a glass last evening and really like it.